Thanks for the response. I’ll be going for the same model as you. The thermostat is just a stat, with a separate timer/programmer at the boiler end. Can you give me some more info about how you changed the wiring? As I understand it, my current stat already has a permanent live, the issue is that it does not have a neutral (it has a switched live instead). I’m considering the alternative option of leaving my current stat, turning the temp high (so it is always switched) and running the heatmiser from a separate fused spur ill set up from a nearby socket. Not as tidy, but easier to switch back in future if needed. I’m so glad that i stumbled across this web site as there is lots of good advice. I am however still having issues with my PRT-HS TS WiFi model. I have it installed and it functions great with the hot water and central heating in the house, but for no end of trying I cannot get the WiFi bit to work. I’ve set the config file up as the manual suggests but still cannot get the little wi-fi signal on the stat. I’d noticed some comments about poor wi-fi range but even with the stat literally sat on top of the router I get nothing. Have also been onto the helpful guys at Heatmiser, who say it all seems set-up correctly but I still don’t get the wi-fi but working. I only bought the stat for the benefit of the remote control function, so am really keen to get this fixed. I’ve got my config file correct, I’m on v1.6 and still pulling what little I have out. Can anyone help me please, My router is a Thomson TG585v8. Any help/guidance is greatly greatly appreciated. Thanks for the link. I received a schematic from Heatmiser’s ever helpfull support. A trip to Maplins for a mains (yes I had to explain it) relay and base – no documentation so I used a multimeter to establish what contact was what; and then to City Electrical factros for a suitable box to contain it was required. I spent quite a while reviewing and checking the required (re)wiring to ensure I didn’t make an expensive mistake. It’s all working well now. I’ve also received the refund check for the incorrect kit, ordered in error. All in all excellent service. It may be a function of my set up – bridged router and Astaro (free for home use) firewall handling the port forwarding – but I just use the app with the EXTERNAL IP address (I have a static IP from Be) of the router as the WAN IP Address (leaving the LAN IP Address blank) and it works fine, whether at home (on the same wireless network) or away. Give it a try. JL – ouch! I’ve just tested this on my unit and got the same result, i.e. the login page checks your username and password, then redirects you to another page. If you take a note of the the address of this page and enter it from another browser, you get full access without any password prompt. Hard to believe such a serious security flaw got into the final product. Have you reported this to Heatmiser? Thanks Ken. When I originally wrote the article, the app didn’t have the ability to auto-connect to either the home or away address as appropriate, but this has been added since. Good to know that you can just put in your external static IP or dynamic DNS hostname. I got past the warning and finished editing the file, but afterwards, I was not able to connect to wifi. As a last resort, I used a Virtualbox XP to run the WiFi Utilility that is downloadable from Heatmiser’s website, and eventually it connected to the network. I have no explanation for this behaviour, but it might be useful to someone else. The thing worked fine for a month or so and then, suddenly, it started crashing, about once every 48hours leaving me without heating… When crashed it’s irresponsive and doesn’t even light up when touched. The Heatmiser needs a hard reboot after every crash, it can be done by turning the power off and back on (circuit breaker). I called Heatmiser support, they told me that the firmware of the 2011 models was faulty and that I needed to upgrade it, that they will send me a “programmer” (device) as it can’t be done “from” a computer like the gazillion other devices that I have upgraded in my life (routers, printers, IP cameras, Macs, etc..) … Does it sound as crazy to your ears as it does to mime ? I’ll update you guys once I have the “upgrade device” and PR-TS WIFI upgraded. Great work Christian! I for one really appreciate your efforts. Although I am now running Mountain Lion I have Snow Leopard on an external hard drive that I can boot from. I will try booting up from it and see if I can connect to the Heatmiser that way. - Security: as of today you can set a username, password, and PIN. The username is only used by the web-interface (which also uses the password but not the pin, the iPhone app uses the PIN only, and the Android app uses the password only. It is not possible to change the PIN without plugging the device in with USB. It’s also not possible to specify the port to connect with in either of the mobile apps meaning that an attacker need only scan IPs for open port 8068 and then try the 10,000 possible PIN combinations to take control of your heating. - Interface: I’m finding some of this quite confusing. I understand how to set a schedule – fine. But then if I just want to knock off the heating, how do I do this? I can set the desired room temperature to a low number which it will maintain until the next scheduled change, but there’s no visual indication that it’s following my override rather than the schedule. There’s an off button but it seems to toggle frost protection which seems counter-intuitive. @Christian – My Macbook is a Late 2008 Aluminium and I put Snow Leopard on to an external hard drive before I upgraded to Mountain Lion. I’ve just tried connecting to the Heatmiser from Snow Leopard and can confirm that it works successfully. Would have been nice to use this thermostat not mounted on the wall, but with the option to put it in any room you like and move it anytime you want, but I assume this is not possible as it is connected to the boiler through wires ? The standard PRT-TS Wi-Fi does connect to the boiler via wires, but Heatmiser do sell a kit with an RF receiver so that you can locate the thermostat itself in a different room, although I believe it will still need to be connected to the mains. Just to keep you guys updated : I received the programer form Heatmiser and was able to upgrade the PRTS-wifi with firmware version 1.6. So far the Heatmiser stopped crashing (was crashing/freezing twice a day before the upgrade). No way to copy the file on the Mac (under 10.8), edit the file and then copy it back… I had to open the file directly from the “virtual drive” with BBedit, edit it (fill my wifi data etc), and then save it at the same spot, on the “virtual drive”. As far as I can remember this is new as before the upgrade I was able to edit the file and then copy it back on the “virtual drive”, replacing the original one. No news on the Heatmisers’ USB “drive not mounting” under Mac OSX 10.7.x & 10.8.x… Sorry for that but it may well be impossible to mount it on Macs with systems above 10.6.x Snow Leopard. A forum member found that it’s NOT only the FAT12 format that is the problem as he was able to mount an old floppy that’s also in FAT12… It may be something else that prevents the “virtual drive” from mounting. I installed one of the Heatmiser Wifi RF kits in Jan. Generally works OK, but every now an again the RF bit fails. Just to be clear the WIFI works fine and I can use an ipad to control the thermostat, no problems there, and it works away from home too as long as you get yourself a fixed IP solution and portforward on your router. I mounted the thermostat on surface mount box with a standard mains lead so now I can move it around from room to room. Boy am i glad I didn’t bury it in the wall. It’s a shame because this poor RF lets down what is otherwise a well designed product. @ Rob : You do not need a fixed IP and instead should get a fee http://www.dyn.com (dyndns) account. Then you enter the parameters of that account in your router (this things almost all have DYN setting) and it will always know what IP this router has. You also better assign a fixed IP (or even better a static DHCP IP) to the Heatmiser so the router forwarding will always be correct. PS : I use dyn.com services daily since years and never experienced a problem. Hi I’ve had an awful boiler fitting experience and now I cant get my Wireless router to connect to the WiFi. Im not sure if ive got all the right IP addresses etc set up and would this prevent the WiFi signal appearing? I’ve lost the will to live, and not sure if the fact I have a WiFi extender is causing an issue also? Any advice that can be given would be greatly appreciated? Tried to follow the internet help and the mini booklet provided and still nothing. Hi Dave, Hi all ! Yes, the Wifi “icon” will only show up if/when the Heatmiser is connected to the router. The extender shouldn’t cause trouble but it must be set as a repeater, nothing else (no NAT etc). The wifi (802.11) protocol of the Heatmiser is wifi 802.11b only… So the router and extender MUST include wifi 802.11b, it can be “mixed mode” “b”+”g”+”n” (but not “g” or “n” or “g”+”n” only). You may also ask for some help from the Heatmiser support team, if they don’t succeed and if you’re on Mac I’ll give it a shot (with TeamViewer). Let me know here. Chris, what about setting up a forum for the Heatmiser users that we all are ? That’s a great idea – clearly this comment section has become a valuable resource for unofficial Heatmiser support and it’s hardly the best medium. I’ve set up a basic forum here and suggest that we use this from now on. my thermostat worked fine for 2 month and now started randomly to become unavailable for remote access. The device seems to drop the WiFi connection and needs a POR to start WiFi connection again. Unfortunately I am using this device really in a distant remote location and I am currently forced to travel twice per week to reset the device. The device is at the latest firmware level according to Heatmiser support. Heatmiser support is very responsive but so far they have no idea whats wrong and how to fix it. Thanks’ for setting up the forum ! hi all i today fitted and installed the prt-ts wifi enabled stat i found it a brilliant design and very techie and geeky which is where i pick up most my work as the average spark may not like this type of job. The only night mare i had was with virgin media as its a chargeable thing thro them £6 a month for port forwarding which they have to do remotely to set up took a bit of time well x3 what it took to install i finally got it going great product. dsb electrical: Yes I can imagine it’s sometimes difficult for people to find an electrician who’s got the skills to set up wi-fi thermostats correctly. Perhaps one solution would be for Heatmiser to have a registered installers scheme that companies like yours could sign up for. I’m a little confused as to why Virgin Media are charging you £6/month for port forwarding though. I was able to set it up myself via the advanced settings on my Superhub with no extra charge. i must say that installation was a complete pain in the a@..! However, it is worth it in the end. Here are my lessons. 1. in order to get the unit to be recognised by the router, you have to fiddle with the encryption settings on the unit. Try changing from WPA to WPA2 or other options. Mine works with WPA2 but not any other option. I have a belkin router which has its own issues. This goes against the advice in the Heatmsier manual, but the advice seems to be router dependent. It will be WPA, WPA2, or “both” settings you will need to use. i would have thought WEP would be unnecessary on most modern routers. 2. You have to set up the unit so that it is working on an IP addess outside the range of those used by the router eg if your router uses IP addresses 192.168.2.1 to 192.168.2.100, then allocate your unit IP address to be 192.168.2.101. 3. Assuming you have set up a dynamic DNS somewhere, or got a fixed IP address for your router, you need to make sure your router does not use its power saving functions. Make sure that if your router has an option to switch off its signal when not in use, please disable this option, otherwise the router will go to sleep after a few minutes. Best of luck. It took me a couple of weeks of faffing to get it sorted. It is excellent now though. Please note that the port you need to forward in your router for access outside your own network is 8078 and NOT 8068! Thanks for the info, Tony. My Heatmiser PRT-TS Wi-Fi (version 1.6) definitely requires port 8068 to be forwarded, not 8078. Which model thermostat are you using? Nice looking product. But if there is no logging, I don’t think it’s interesting to buy. It would be nice to have graphs of the temp. and operation data. Guess I will have to look further. Thanks for providing such a useful reference! One thing others might find useful – the Firmware on your device might need to be at 1.3 (you can check it by pressing down on the blank space on the front LCD panel just to the ‘right’ of the up arrow key (which raises the temperature). Hold you finger in that blank space for 10 seconds and it will display your firmware version). My firmware was 1.2 – and when I went to reprogram my settings as I had installed a new wifi router – I had issues that my laptop wouldn’t recognise the mass storage device (It kept offering to “format” it, and the Wifi utility said “Connection Failed” error. Fortunately the people at Heatmiser did identify that the problem was firmware, and they sent me a device to upgrade it (which you return back to them in a pre-paid envelope). This has now fixed my problem. I can confirm, that on my device it is still port 8068 that you need to forward. I was easily able to do this on my previous BT Homehub3 and now on a Virgin SuperHub 2. If you have a Raspberry Pi or other Linux box (I use a $20 Linode VPS, you can get logging functionality using the heatmiser-wifi Perl scripts. Thanks for the tip on checking the firmware version. It took me a couple of tries to get it working (probably due to not holding my finger down long enough) but eventually I got the display to show “16″ indicating that I’m running firmware version 1.6 (which is correct). Are there better alternatives at the moment, which have the same functionality and work with 230v? 1) If network connection is lost, will the Heatmiser PRT-TS continue to operate and keep the home temperature as programmed? 2) About the poor wifi signal – if my wifi router is on the second floor, approximately 15m from the thermostat, will it work? 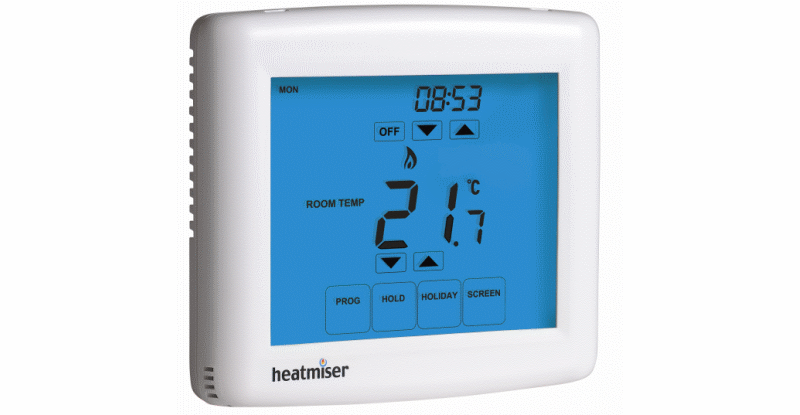 I think that the Heatmiser unit is the best option for a wi-fi thermostat at the moment but am happy to be proved wrong. 1) Yes, the network connection is only required to access the thermostat remotely (i.e. via web browser or iPhone app). If the network connection is unavailable, the thermostat will keep working. @kevin, check the security type on all devices on your network, wpa2/aes is working well for me, i ended up installing a cheep router with a hidden network just for devices running 802.11b & g.
Perhaps someone can help. Sometimes I have problem connecting to the thermostat from my phone, it simply shows Loading … , and nothing happens, after some time loading circle freezes. My phone has internet connection, also I can connect to my home router from outside. I have setup raspberry pi from your tutorial, I can connect to it as well and get the latest data now, but I simply can’t do it with my phone at the moment. Normally it works fine, but sometimes it doesn’t. I know I should contact first Heatmiser support, but perhaps anyone here had the same issue and knows how to find out where’s the problem, are there any log files heatmiser app is creating? thank you for your very detailed information. Which is already a great help researching. I am thinking about installing the heat miser prt-ts in our holiday home, as it would be perfect to be able to control the heating from far away… but the crashing that has to be fixed by a physical reboot sounds very spooky as I wouldn’t be able to reboot the thing without driving out there… Would you recommend the system for a holiday home? Do you think it is up for the task or will it at least evolve fast enough in order to work seamlessly? I have had a couple of occasions where the unit has stopped responding to requests from the iPhone app, and needed a hard reboot to fix. However this could just be an issue with my particular unit or setup. I haven’t had any issues with the unit locking up completely – it still continues to turn the heating on and off based on the temperature and time settings. Another option is Hive Active Heating from British Gas. Not something I’ve personally used as I’m happy with my Heatmiser, and it is a bit more expensive. I’ve had a look at these from a security perspective and they are pretty bad really. The PIN can just be brute forced. This is my blog post on it. This is a great blog, really useful, thanks Chris. I am now encountering problems with my Heatmiser because of the 802.11b issue. I recently upgraded my Virgin Media Service and the new Superhub does not support 802.11b – so I have the lost the network connectivity that I paid so much for only a few months ago. Any suggestions for how I get it back? All help appreciated. Regards, Nick. Assuming you’ve spoken to VM to see if there’s any way 802.11b can be enabled on the new SuperHub, and failing that whether Heatmiser have a software update to enable 802.11g/n (which I guess is unlikely), I would probably just pick up a cheap 802.11b wireless access point, connect it to your SuperHub and set up a separate wireless network just for the Heatmiser. A bit of a faff but it’s the only solution I can think of. Hi, i accedentally i deleted the config.txt file. Can somebody send me the text contained or the whole file? So I have 3 of the PRT-HW/TS units for three separate zones, I also have the multi link. I installed it about 18months ago and failed to get it working on wifi so operated them each from their units. I had been using Mac’s to configure both the Multilink and Thermostats. I tried again tonight, and still failed to join any of my wifi networks, it seems that the Thermostats would forget their settings after a manual/force power cycle to reboot, as they never rebooted like the instructions stated. Simple resolution, and I hate to say this, though its clearly a Heatmiser issue with their developers incapable of writing Mac OS X apps, as soon as I used a Windows PC, it worked right away! I like the hint stated here that you do not need to have the units on the wall or powered by mains, as the USB connection will power them. So remove the Thermostats, plug them into a Windows PC or Windows VM and you can configure and test them before returning them to their home in the walls. So, if you want to configure the Thermostats you are gonna have to find a Windows OS to do it with. Heatmiser, I presume you will fix this as it really lets you down. Mac people are most innovative, therefore your product will appeal more to them than most, they are an important base for you to cover. I only have one Windows PC left in my house, lucky I could use it for this. I don’t even have any Windows VMs left anymore in my Mac Fusion app. Don’t count on everyone having a Windows PC! Hi guy. Have we got a heatmiser PRT-TS WIFI termostat? My problem is that the termostat don’t run on windows pc. When I plug it at pc the windows system asks me to format. I have one of these working well bought in 2013. I just (Mar 2015) failed to locate it again on the Heatmiser web site. I asked Heatmiser support and they replied that they no longer make wifi thermostats. They now have a neo range but it requires a separate gateway box which makes it a more expensive solution. The USB connection to a windows PC allows access to files on the thermostat for configuration. If you want to see the web interface you need to access via WiFi using a web browser.